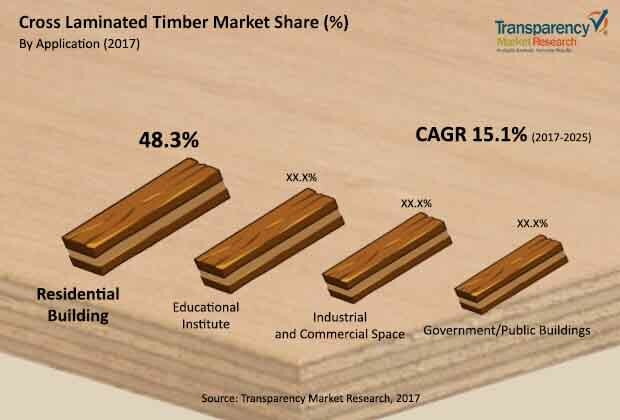 The global cross laminated timber (CLT) market depicts the presence of a highly fragmented and competitive vendor landscape, notes Transparency Market Research on the basis of a newly published report. Such an intense competition mainly exists thanks to the presence of innumerable players. Most companies are focusing on facilitating product differentiation and expanding their product portfolios in the global cross laminated timber (CLT) market. Nordic Structures, Mayr-Melnhof Holz Holding AG, Binderholz Bausysteme GmbH, Structurlam Mass Timber Corporation, Ed. Züblin AG, and Sterling Lumber Company, are key companies operating in the global cross laminated timber (CLT) market. The competition is likely to intensify with increasing number of players in the next few years. As per expert analysts, the global cross laminated timber (CLT) market was valued at US$670.2 mn in 2016. This revenue is further expected to reach valuation of US$2332.1 mn by the end of 2025. Such a prolific growth is projected to occur at a spectacular CAGR of 15.1% during the forecast period ranging from 2017 to 2025. On the basis of product, the adhesive bonded CLT segment leads the global cross laminated timber (CLT) market. This is mainly due to a prolific rise in the number of residential buildings being constructed where such adhesive is used in high proportion. Region-wise, a strong competitive scenario in Europe made this region accumulate highest revenue in 2016 in the cross laminated timber (CLT) market. And this is expected to continue even in the near future. With rising demand for sustainable building solutions, the global cross laminated timber (CLT) market is witnessing a highly positive growth rate. This is mainly due to the fact that the CLT material can serve as a useful alternative to other products that might be manufactured from environment polluting processes. Cross laminated timer is renewable and hence can offset most of these effects. Moreover, with increasing encouragement from several governments to utilize renewable materials for construction, the global cross laminated timber (CLT) market could witness immense expansion in the next few years. In addition, CLT systems help create a highly breathable environment. This advantage is highly necessary to instill a sense of improved comfort inside modern constructed structures. Thus, the need for utmost comfort that can be derived from CLT is a major factor driving the global cross laminated timber (CLT) market. However, CLT might not be readily available in many underdeveloped and remote regions. This makes the global cross laminated timber (CLT) market exist at a notably nascent stage in such geographical extents. Moreover, production of this timber might be substantially costly due to its eco-friendly nature. Such costs might increase the end service expenses, typically of the space inside a constructed structure. As not everyone can afford high costs of sustainable living, this aspect makes it difficult for the global cross laminated timber (CLT) market to proliferate beyond a certain limit. Nonetheless, several players are trying to reduce the production costs. This can reduce effects of most restraints affecting the global cross laminated timber (CLT) market.